kulay-rosas Season ALBUM...Which is your paborito song? Une Année ALBUM...Whic is paborito song? kulay-rosas MEMORY ALBUM...Which is your paborito song? 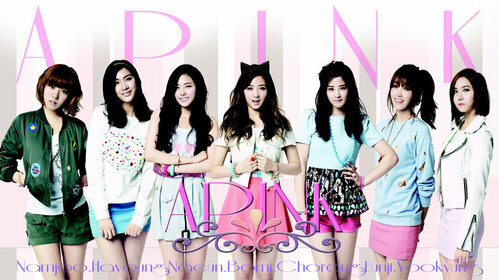 do you think APINK is the best? A Cube Entertainment announced that K-pop girl group Apink are ready to kick off their first ever North American tour this week. Korea Herald reported Monday that the South Korean act is slated to begin kulay-rosas Memory: Apink North American Tour 2016 at The Orpheum in Vancouver, Canada today. Apink will go straight to Dallas on Wednesday to perform before their fans at Verizon Theatre, while on Friday, the group will hold a konsiyerto at Regency Center in San Francisco before they will conclude their North American tour at Club Nokia in Los Angeles Saturday. Apink has never really had a break-up song. All their songs have been about love, with lots of bright mga kulay and pastels, but most of all, a lot of pink. Now, they have a slightly madami mature concept (while still keeping some of their cutesy aspects), with a bittersweet break-up song. With A Cube Entertainment revealing that A kulay-rosas will be holding their North American tour, there is excitement from kulay-rosas Pandas (A kulay-rosas fans). A Pink's Naeun starred in "A Better Me" for the November issue of Grazia. The stunning bituin rocked youthful combinations that used a variety of geometric shapes, studs, buckles and decorative zippers. All of the pieces were from Rebecca Minkoff's Fall/Winter 2015 collection. The K-pop paborito brand is known for its sensible pumps, miniature purses and beach-ready dresses. If a member of A kulay-rosas is away, their manager steps up to the plate! A video posted to YouTube of A kulay-rosas rehearsing for a live performance has gone viral after fans took notice of their manager's dance moves. The video featured A Pink's manager standing in for member Eunji and performing the dance moves perfectly. kulay-rosas Pandas in Hapon are going crazy for A Pink. The Korean girl group successfully wrapped up their first tour and performed live for 5,000 kulay-rosas Pandas in Japan. On Sunday, Oct. 4, A kulay-rosas were in Tokyo, Japan, were they performed their Japanese and Korean hit songs for the fans in attendance. The konsiyerto was held at Tokyo International pagtitip. Hall and also broadcasted live in 50 theaters all over Japan. A Pink's Hapon tour, A kulay-rosas 1st Live Tour 2015 - kulay-rosas Season kicked off on Sept. 3 with the K-pop group making stops in Nagoya, Fukuoka, Osaka, and Tokyo. A Pink's Jung Eunji spent her Chuseok being a busy bee over the weekend when she shared a litrato on Monday, September 28. "Did you have a great Thanksgiving? I'm still filming... Last araw of the Thanksgiving break! Take care~ Sassy, Fighting! !," she captioned Twitter. Followers and fans of A Pink's member tweeted and nagkomento on the litrato saying, "So pretty~," "Fighting, Eunji," and "Eunji is so good at both pagganap and singing." A kulay-rosas shed tears as they balutin up the first araw of their 'PINK PARADISE' solo concert.